Slip ring Induction Motor, How it works? Induction motors have been ruling the industrial world for many decades. In the induction motors used in lift and hoists, you will see a type of rotor called a slip ring rotor, whereas in most of the other applications you will see a simpler, squirrel cage type of rotor. Why are there two different designs of rotor construction for induction motors? Normal induction motors, or squirrel cage type motors, produce a very low starting torque, and for some applications, this low starting torque will cause huge problems. It is in these circumstances that slip ring induction motors are used, as they produce high starting torque. 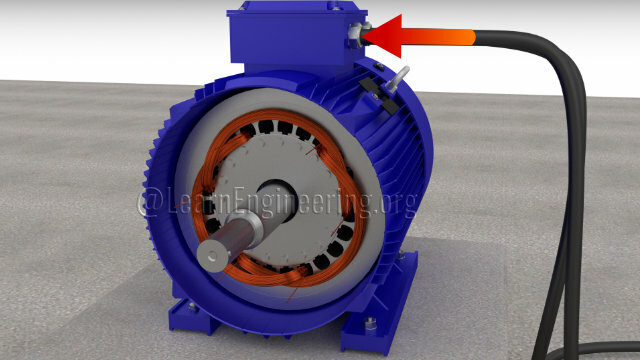 First, let’s have a look at the way a squirrel cage induction motor works. 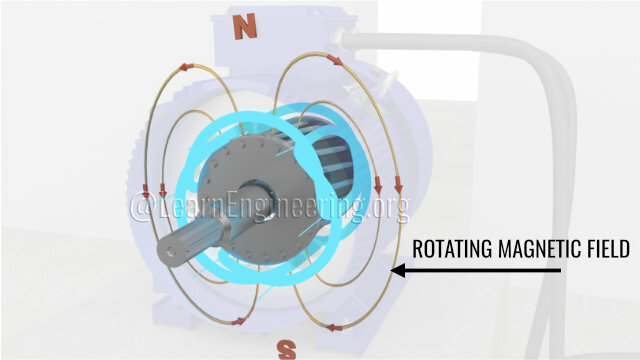 When a three-phase AC supply is connected to the stator winding, it produces a rotating magnetic field in the air gap between the stator and rotor. This RMF cuts the rotor bars. According to Faraday's law of electromagnetic induction, an electromotive force is induced in the bars. Because the rotor bars are short-circuited by the end rings, this induced EMF generates a current to flow through the rotor bars. According to Lorentz’s law, when a current carrying conductor is placed in a magnetic field it will experience a force. You can see the force distribution on the different bars at a particular moment in time. These collective forces make the rotor turn. This explanation of the way an induction motor works won’t be complete without an understanding of the concept of inductance. To understand what inductance is, let’s consider a simple circuit. The circuit is a combination of a resistor and an inductor in series, which is connected to the AC sinusoidal voltage. Let us connect a phase angle meter to the circuit, to measure the phase difference between the applied voltage and the current. You can see that the current flowing through the circuit is not in phase with the applied voltage. This is because of the presence of inductive reactance in the circuit. The higher the frequency of the electricity, the greater will be the inductive reactance and the phase difference. A higher resistance value reduces this phase difference. The exact same thing is also happening in the rotor. The rotor is a combination of resistance and inductive reactance. Due to the same phase lag phenomenon, if the maximum EMF is on one bar, then the maximum current will be on another bar. Now, here is one interesting fact about induction motors. An induction motor produces maximum torque when the maximum current, induced on the rotor, is near to the maximum magnetic flux. This fact is clear from the comparison of these two visuals. Let us call it the “Maximum torque condition”. Throughout this video please keep this fact in mind. As the current induced does not meet the ‘maximum torque condition’, this will definitely reduce the amount of torque produced by the induction motor. This phase difference will be high as the motor starts. Let’s see why. At startup, the rotor speed is zero. Due to this, the magnetic field will cut through the rotor at a very high rate and the frequency of the induced EMF will be high. This leads to the high phase difference, which causes the very low starting torque of a normal induction motor. To overcome this problem, the slip ring induction motor comes into the picture. The working principles and stator construction of the slip ring induction motor are exactly the same as that of the squirrel cage motor. However, the rotor construction of the slip ring motor is quite interesting. Instead of bars, in this motor three windings are used. This construction of the rotor is aimed at reducing the phase difference. Let’s see how the slip ring rotor does it. For ease of understanding instead of the current 24 slots winding let’s use a 12 slot winding. Here again, the RMF induces EMF across the terminals of the windings. Let’s join the winding ends in a star connection and again assume that the inductive reactance is zero. The current flow established in the winding will be as shown. However, in practice, the current flow will be lagging behind the induced EMF. Here again the ‘the maximum torque condition’ is not met. In the slip ring induction motor, there is an option to reduce this EMF current phase difference, by use of external resistance. The other ends of the coils are connected to an external resistance via the slip rings. We saw in the simple circuit that by increasing the resistance value we can decrease that phase difference. As a slip ring induction motor starts, the external resistance value is increased. This reduces the phase difference angle and the current induced approaches the ‘maximum torque condition’. This way slip ring induction motors will be able to produce high torque even as they are starting. These graphs clearly show the higher starting torque produced by slip ring motors in comparison to squirrel cage motors. Apart from the high starting torque, it also has some other advantages, and although slip ring induction motors have some disadvantages, they play a very important role in elevators, cranes, hoists and in industrial uses such as printing presses. Please support us at Patreon.com and don’t forget to subscribe to our channel. Thank you! Her areas of interest are Power System, Power Electronics, Electrical Machines.